Powerful countertop machine grinds 2-3 lbs per minute. 575 watts, ¾ HP. We packed 500 watts and 5/8 HP into this compact countertop machine. Grinds 1-2 lbs per minute. Grinds 2-3 lbs per minute. 650 watts. 7/8 HP. Comes with Realtree Xtra® camouflage storage cover. Powerful countertop machine grinds 2-3 lbs per minute. 575 watts, ¾ HP. Realtree Xtra® camo face plate. Hand-crank meat grinder. Comes with suction cup feet and a Realtree camo storage cover. 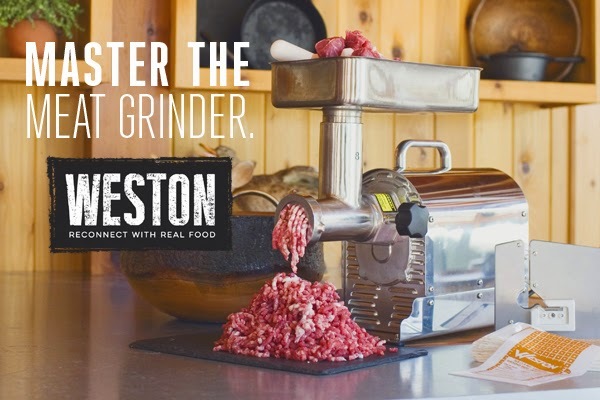 Small meat grinder that also allows you to process other foods into purees and sauces. Hank-crank meat grinders available in #8, #10, #22, and #32 sizes. Click to view pricing. Connect this foot pedal to your Weston Electric Meat Grinder for hands-free use! This patented burger press attachment for meat grinders forms perfect, uniform patties as you grind - automatically.